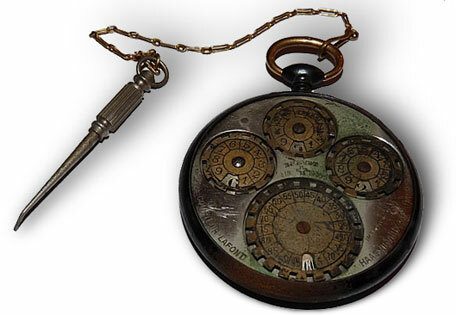 In 1899 the french engineer Georges Lafond from Paris patented (German patent DE148810, US patent US653250 and Swiss patent CH19395) an interesting watch-like circular adding machine (see the photo below). 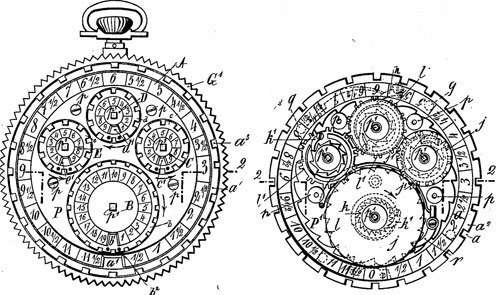 In fact, the patents described several different types adding devices, and only one of them (the circular one) seems went into production. The stylus operated disk adder was in production since early 1900s, manufactured by a famous watchmaker workshop from Geneva—Haas Neveaux & Cie. It is a metal chromium device, diameter 47 mm, with four sunk silvered revolving counters each with an aperture. In fact, it is a simple form of circular four-dial Pascaline type calculator where a stylus is used to move the individual wheels to carry out addition and subtraction.